More than 25 years ago, Cabuchon launched a pioneering range of modern deep soaking tubs inspired by the traditional Japanese ofuro. The first of their kind anywhere in the world, these luxury baths yielded benefits that were previously thought impossible. They have quite literally changed bathing habits forever. What is a Deep Soaking Tub? 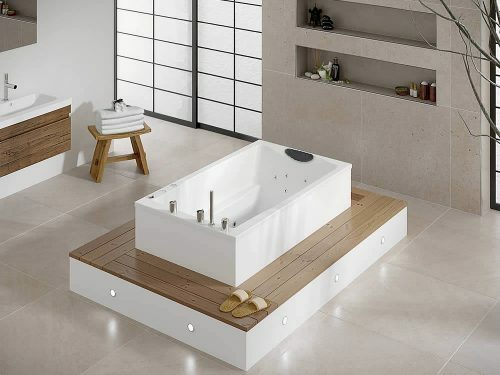 A deep soaking tub is a compact, steep sided bath in which the bather adopts a seated position. As the name suggests, the bather is able to sit, well supported, whilst submerged to the upper chest in water. 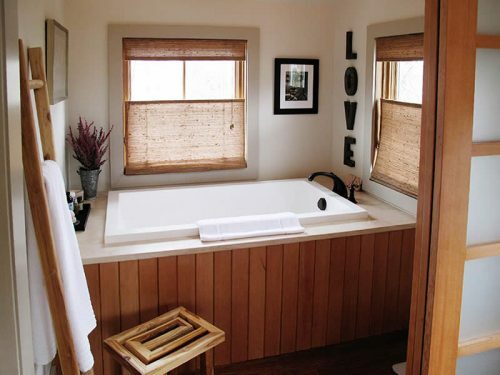 By substituting depth for length and width, soaking tubs save considerable amounts of space within the bathroom and use much less water than the conventionally shaped bath. Backed by a 25 year guarantee, Cabuchon’s deep soaking tubs substantially outlast and outperform their imitators. Customers across the globe have testified to their superior style, value and exceptional comfort. A soaking tub is also ideally suited for use with bespoke hydrotherapy spa systems. 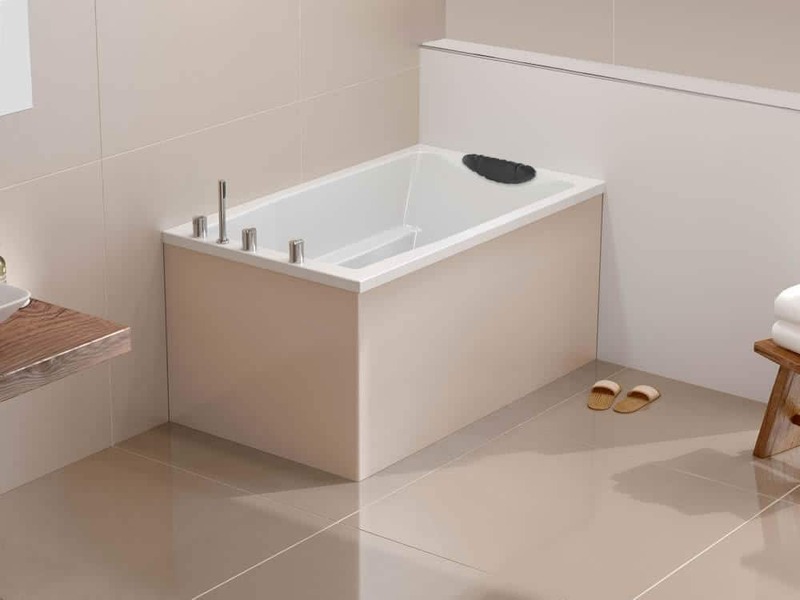 Unlike the original Japanese ofuro, our soaking tubs also incorporate a seat, which adds greatly to the bather’s sense of comfort and relaxation – largely because most bathers find it more comfortable to sit with their feet lower than the rest of their body. This seat, coincidentally, further reduces the amount of water required to fill the tub. These innovative features made our first soaking tubs extremely popular, effectively creating the modern market for luxury deep soaking. Since 1991, our baths have spawned many imitators, but nothing that boasts the same comfort, robustness and unique materials. It is telling that we now sell soaking tubs to customers right across the world, including those from Japan. 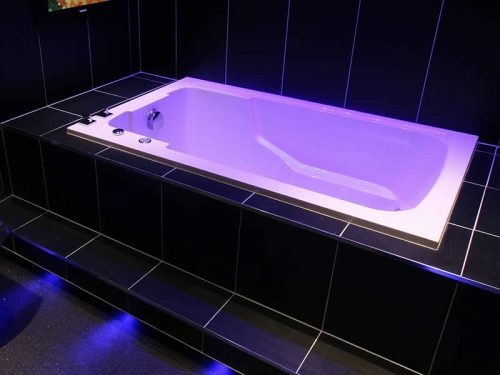 All our soaking tubs are designed to accommodate, on request, a hydrotherapy system individually tailored to suit the bather’s needs and preferences. All such systems come with a lifetime guarantee on pipework and jointing. Please note that when purchasing a deep soaking tub and hydrotherapy system together, Cabuchon customers enjoy a saving on the overall cost. the water jets are set close to the bather’s body. In all, there are seven different deep soaking tubs in our range, based on five different models that vary in depth, style and size. Two – the Imersa and the Calyx – are each available in two sizes. The Imersa is more traditionally styled (if a soaking tub can be termed ‘traditional’,) whilst the Calyx is a sleeker, minimalist version. 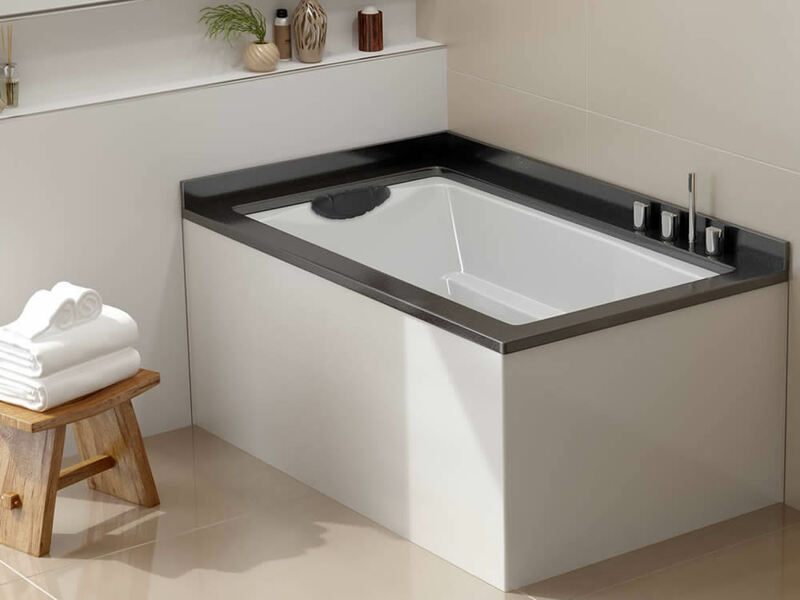 The Xanadu is a two-seater bath tub, designed for shared bathing, and the Nirvana is our best selling bath worldwide, owing largely to its ease of use and great comfort. The latest addition to this market-leading range is the Yasahiro. 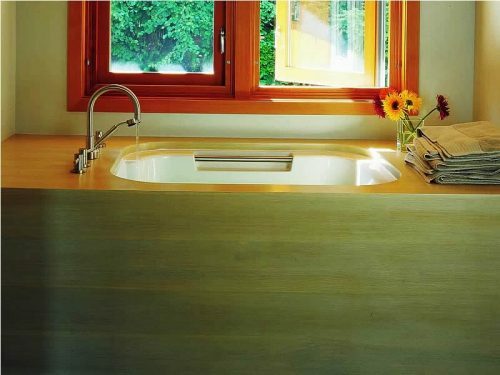 The Yasahiro brings together the most popular features of the previous four generations of deep soaking tub. The result of years of trials and research, its development was informed by feedback from many satisfied customers who had previously bought one of our deep soaking tubs and who were asked for their views about ‘the perfect bath for soaking’. They bring greater comfort to bathing. They use less water than a conventionally shaped bath of the same external dimensions, let alone a bath of standard dimensions, which is larger still. 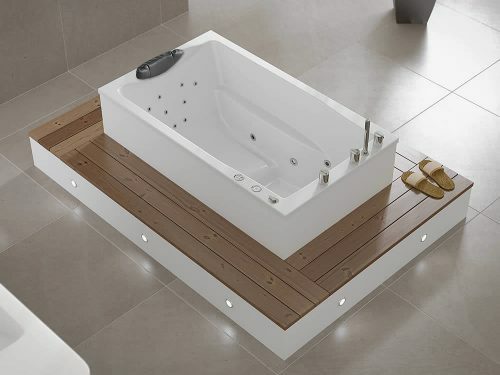 Sunken or with a fitted or removable step, they are easier to enter and exit, and therefore safer than a conventional bath, because at no point does the bather have to balance. If needed, suitable grab bars can also be fitted to the adjoining wall. Turned on their sides, they pass through a conventional 730mm / 29” door. Depending upon the precise need, we can sometimes, for a small charge, modify feet/fittings to pass through slightly narrower doors. Taps/faucets can be mounted in any location where space permits. The only constraints are those of good plumbing practice. Installed with an overhead or wall shower, and a bath/shower screen, they combine the functions of tub and shower in one space. Because of FICORE’s natural heat retention, the water in our deep soaking baths stays hotter six times longer than acrylic baths and twelve times longer than in steel or cast iron. These heat-retentive properties are further enhanced by the smaller surface area of the water in a deep soaking tub. Because of their small size and their internal design they are particularly suitable for Hydrotherapy. If fitted with an in-line water heater, Cabuchon deep soaking baths can be enjoyed for as long as the bather wishes, without having to top up the water, affording the very pinnacle of pleasure for those who love long, relaxing soaks. 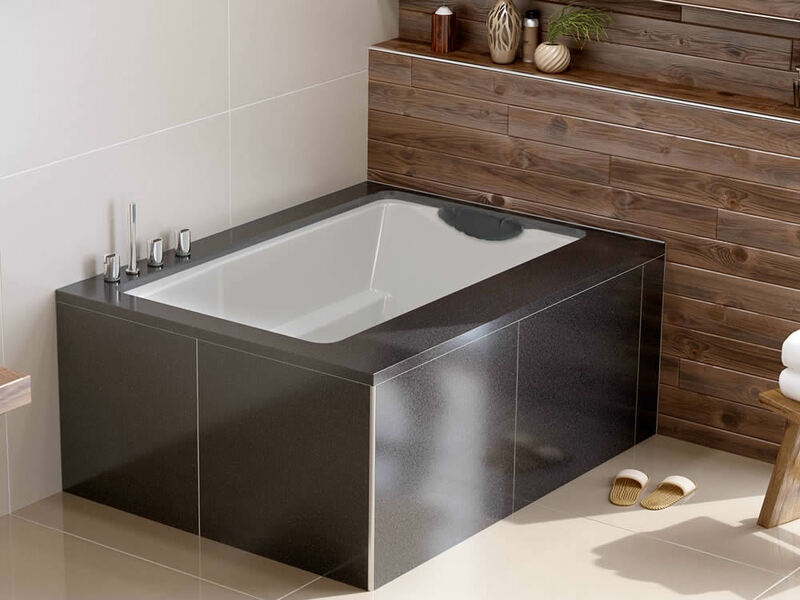 For these and other reasons, our deep soaking tubs have proven immensely popular with clients throughout the world and have built up a track record that spans more than a quarter of a century. Indeed, some of our customers have bought one our tubs because their parents had one and, from childhood, they grew to prefer them. 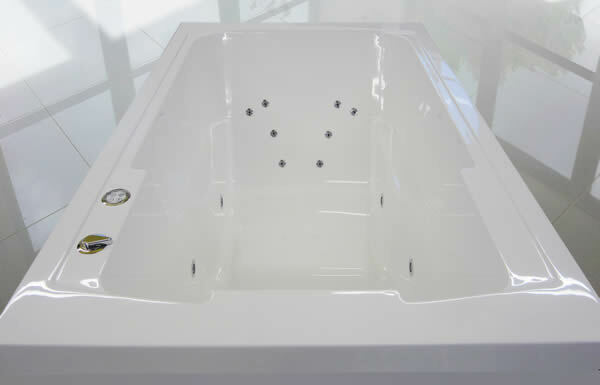 Likewise, we have served a number of customers who, having bought one of our soaking tubs, subsequently returned to buy a second model when they moved home. Once experienced, our deep soaking tubs always impress and, whilst they certainly have their imitators, they have never yet been equalled. 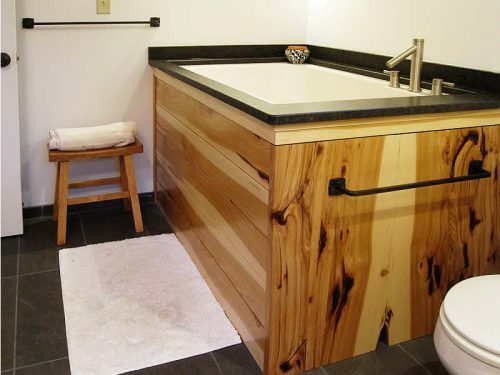 Any deep soaking tub can be installed inset, under-mounted, sunken, or free standing with one or more panels. The following shows the Yasahiro deep soaking bath undermounted beneath a polished slate deck. The Yasahiro deep soaking tub, shown undermounted beneath a slate deck. Each tub is handmade and custom-built to order. Due to the exceptional qualities of FICORE®, Cabuchon can match literally any colour, including the various sanitaryware manufacturers’ different versions of white. It can also match any other colour, given a paint swatch or sample for comparison. 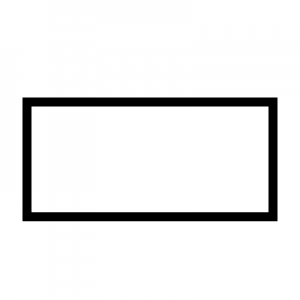 External dimensions can to some degree be modified – i.e. 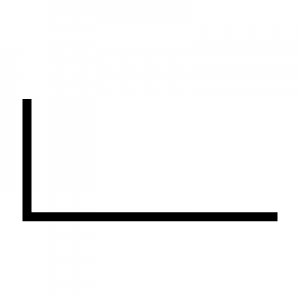 enlarged or reduced – to suit the space available. 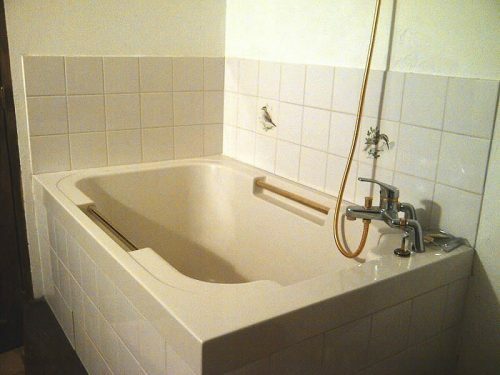 For other possibilities please see Bath Tub Options. The Calyx deep soaking tub set into a wooden surround. 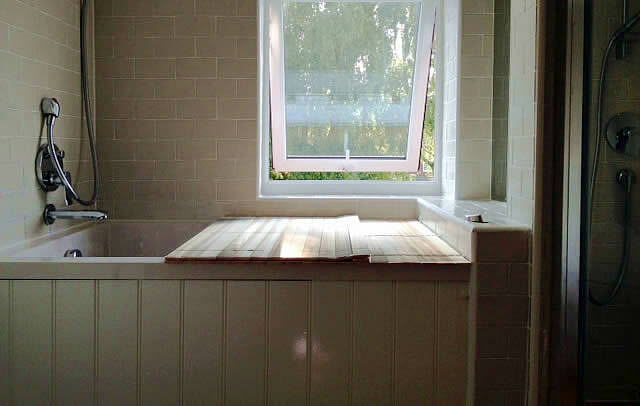 Many deep soaking tubs are installed inset – i.e. set into raised decks or surrounds made of wood, tile, stone, slate or marble – as shown in the two photographs above. Alternatively, through the use of panels, they can be made to appear free standing. Where required, we therefore offer FICORE® panels for all the models in our family of deep soaking tubs. 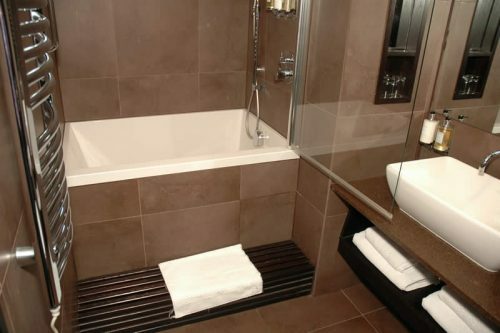 Panels are supplied separately from the bath in order to allow removal after installation. This allows access to normally hidden parts such as the waste, the overflow, the tap valves or Hydrotherapy components. All panels are supplied in one piece, no matter how many sides or ends they are designed to cover. We do this for security and stability and ease of handling. All our panels are handmade and custom-built in FICORE® composite to match any one standard sanitaryware colour. 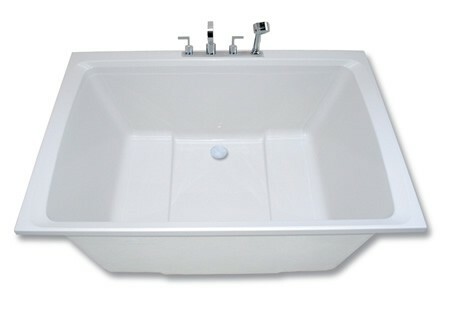 If the customer requires the panel to be produced in a different standard sanitaryware colour to the bath itself, then there is a small surcharge. For a ‘special’ colour (and bear in mind we can match literally any colour – e.g. to match the base colour of a sample of fabric or stone) there is a modest surcharge for computer colour matching. Bespoke and specially coloured bath panels are available. The diagrams below show all our standard panel configurations and identify how each would be used. When ordering, please use the following terms and state for which bath the panel assembly is required. For example: “Nirvana, front/right panel”. Across the front of a bath in a niche or an alcove. 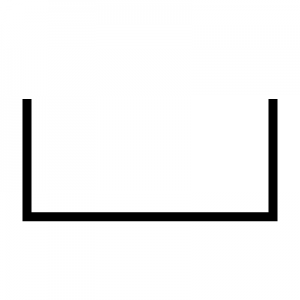 For a bath with its back against a wall. 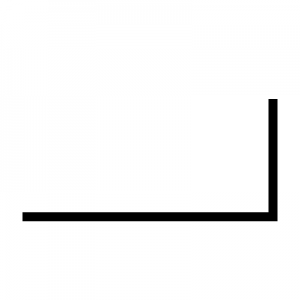 For a bath with one end against a wall. For a bath to appear free standing. 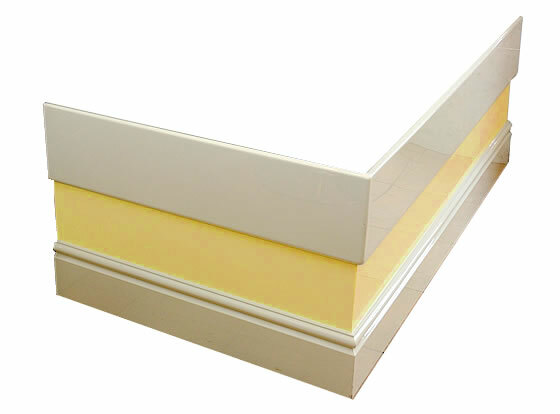 A Yasahiro, fitted with a coloured FICORE® panel (front/left) covering two sides. The Yasahiro again, undermounted and with a FICORE® front/right panel. Please note the absence of an overhanging spout. This example is fitted with a combined filler/overflow/waste, in place of the usual extended waste/overflow. A combined filler / overflow is often a good idea in a deep soaking tub or any small bath tub because it removes the need for a spout. If you would like more information, detailed specification sheets can be found on the individual bath pages shown above. 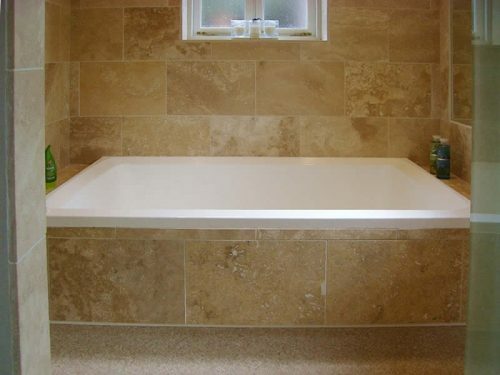 All our baths can be customised to suit your needs. If you would like to discuss a particular requirement, please use our reply form or contact our customer services team. UK customers, please dial 01524 66022.
International customers, please dial +44 1524 66022. 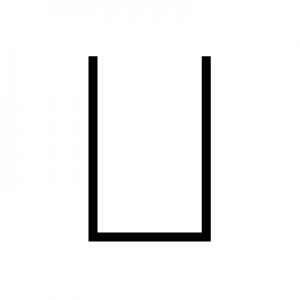 Cabuchon is a registered trademark of Design & Form Ltd. Cabuchon Bathforms is a division of Design & Form Ltd.
Ficore and Vitrite are registered trademarks of Design & Form Ltd.